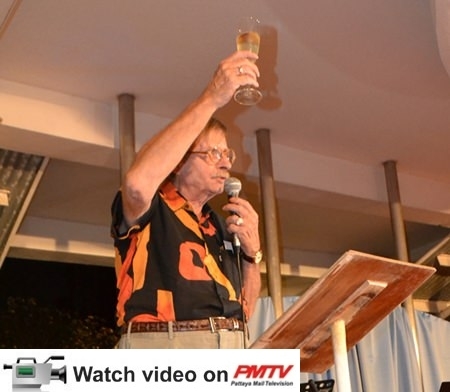 The Dutch Association of Pattaya celebrated its 10th anniversary with a party at the Royal Varuna Yacht Club. Martin Brands, president of the group known as “Nederlandse Verenining” in Dutch, greeted Netherlands Ambassador to Thailand Joan Boer and his wife Wendelmoet to the Jan. 13 event where guests were serenaded by the Angalung Orchestra from the Banglamung Home for Boys. Boer presented all the players with gifts afterward. Heiko Klimanschewski, owner of the Poseidon Boutique Hotel, hosted the gala buffet with his Dutch chef preparing a full menu starting with traditional “Oliebollen” new year’s pastries. President Martin Brands wishes all a Happy New Year. Brands introduced the ambassador and thanked all the members, who took up a glass of sparkling wine each for an association new year’s toast. Boer wish all the members good luck and urged them to set an example for humaneness and friendship in order to show off the good qualities of the Netherlands. He also said he was proud to have such good fellow countrymen not only in Bangkok, but in Pattaya. 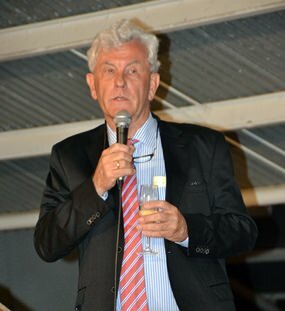 His Excellency the Dutch Ambassador Joan Boer wishes all Dutch Association of Pattaya members good luck and urges them to set an example for humaneness and friendship. 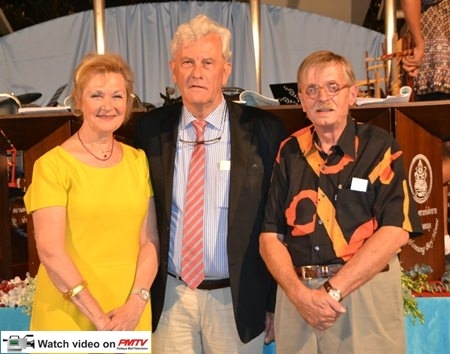 The two founding presidents of the association, D. Brosma and Piet van der Broek, were honored with Boer presenting them with a Thai deer-hunting knife with silver grip, as well as a painting from Holland. The ambassador himself also received a hunting knife as a gift. 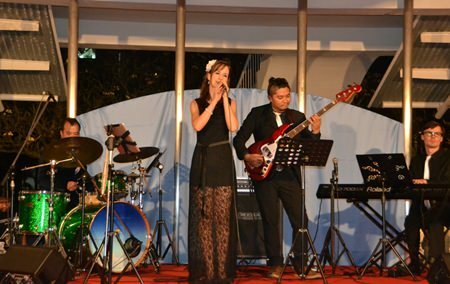 During and after the meal famed singer Athalie de Koning came on stage, accompanied by her band Jazziam. A Hun Lakorn Lek puppet show performed by the Khlong Bang Luang ensemble rounded the evening. Guests laughed heartily at the puppeteers’ jests as they mingled with the audience. de Koning and the band ended the evening with more of their repertoire. The audience danced, including Boer and his wife. President Martin Brands (right) greets the guests of honor Ambassador Joan Boer and his wife Wendelmoet. Famed singer Athalie de Koning took the stage, accompanied by her band Jazziam. 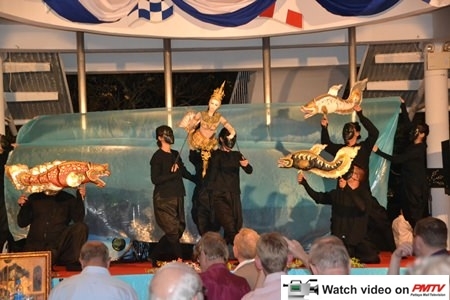 A Hun Lakorn Lek puppet show performed by the Khlong Bang Luang ensemble rounded the evening. 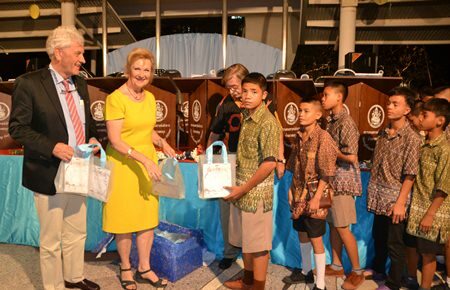 The members of the Angalung Orchestra receive gifts from the hands of (from left) Wendelmoet Boer, Ambassador Joan Boer and Martin Brands. Guests were serenaded by the Angalung Orchestra from the Banglamung Home for Boys.